Tulips, tulips, tulips… Who doesn’t love them? White and red, pink and blue Flower Shops has all of them just for you. Tulips are not only easy to adore but also good for most any occasion. You might think that the Netherlands is where these flowers come from, but you’d be mistaken. It’s understandable since they are its symbol, but if we are being exact, tulips originate from ancient Persia and were cultivated in the Ottoman Empire centuries ago. Now, in Turkey, the successor of that empire, what we know as tulip is called ‘lale’. A declaration of love is what red tulips used to symbolize in Persia – their black central part being the heart burnt with emotions of the one who loves passionately. But enough with the history Tulips Deliverylesson, and let’s dive into the world of this quite delicate flower. With their clean lines you might think that tulips look too simple, but they actually can be called tender and fine. As frail as they may seem at first glance, once you get to really know them, they may turn into your favourite flower. If you are all about delicacy and sophistication, you might want to consider having some tulips from Flower Shops around to reflect your personality. Among them you’ll feel like yourself because associated with them, they’ll give you the calm energy that you need to be surrounded with. Underestimating the power of having the flowers you most like in your home would be a mistake because on subconscious level they are capable of giving you positive energy just by taking one look at them. Our company assures you that the tulips you’ll order from us will arrive to the address we’re given in perfect condition right on time for an event or why not without any occasion at all. Surprises are loved by almost everyone, so an excellent flower arrangement made of tulips is just as good as any other unexpected present given wholeheartedly. And the florists we have will certainly contribute to the splendour of the arrangement with their inventiveness and imagination. 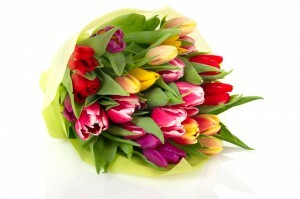 Tulips may seem simple but put in a bouquet they will not only be dainty but rather playful as well. No matter how you want them, our floral arrangers won’t spare any efforts and inspiration to make your tulip flower bouquet look exactly as you want it to, or even Bouquet of Tulipsbetter. More than once our floral arrangements have astonished people with their exquisiteness. We can’t say that potted tulips are better than the fresh-cut ones. After all, it’s the same flower, but one is just more durable than the other. They are both delightful and grow from the same bulbs; the only difference is that potted plants can be enjoyed year after year. And if you decide to send them to someone who has gardening as a hobby, you won’t make a mistake because he or she can plant them alongside the other flowers in the garden. Now, take one step back and look at that garden from a distance. The view is wonderful, isn’t it? And although they bloom in the spring, we can provide them to you in any season so that they can bring delight at any time. Like any other flower, tulips also carry symbolism of their own. All kinds of emotions can be expressed by tulips according to the colour they come in. The red ones symbolize endless love, for instance. Sunshine and joyfulness is what yellow tulips are believed to have as a their meaning. Behind the way purple ones look is the symbol of nobleness and stylishness. 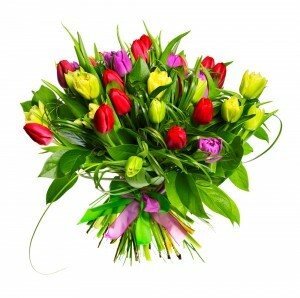 Here is our phone number: ‎020 3900 2440, in case you’re ready to call the best flower delivery company.